Competitor Analysis – Know your competition! Why is a competitor analysis so important for your business? Did you already notice some traffic drop, lower sales, sudden lack of visibility online? In order to successfully increase your traffic and create brand awareness, it is vital that you know your business!! But is that enough? A competitor analysis is a great way to learn more about your competition, your niche, your environment and activity while improving your own business. With this process you will be able to identify your SEO targets and get relevant insight in order to help build your strategy and most importantly get in front of your main competition in the run for organic traffic and keywords ranking in the SERP (Search Engine Result Pages). When trying to beat your main competition, it is necessary to be methodical and always follow the same analytical process. Let’s start the competitors analysis by following these basic steps. It is very important that you don’t limit your research to other companies or websites that offer the same type of products or services. Broaden your scope and search for everyone who is competing with you in search results pages for keywords related to your business and niche activity. That is the only way to cover all your bases. Here are some tools that will greatly help you to make it happen: Alexa Top Sites, SimilarWeb Websites Ranking & Sites Profile. SEMRush for keyword data, SuggestMrx (you can also use Ubersuggest or SEOchat Suggestion Keyword Finder) to gather Google suggestions for your keywords. If you are specifically looking for Social Signals (such as shares, twitter, comments, etc…), we would suggest for you to use http://buzzsumo.com/. It is a great tool to be able to identify how content are performing globally for any topic or competitors. It help you decide which piece of content is relevant and thus where you should be focusing your content production efforts on. Now that you know who your competitors are, which keywords and content to work with, you will need to analyse your competitions’ websites as well as their link profiles (or backlink profiles). Here is when it gets a little tricky: none of the tools we selected for you will help you find all links. In fact, each tool might find different links. Now what? Do not panic, we can help. If you want to make sure you have a complete competitors analysis (for the backlink point of view), we can let you in on our little secret: combine all tools, extract and clean all data in order to get the complete picture. Once you have arrived to this fase, it’s time to see where you really stand. Compare their website to yours. The analysis to your competitors is done, now go compete! 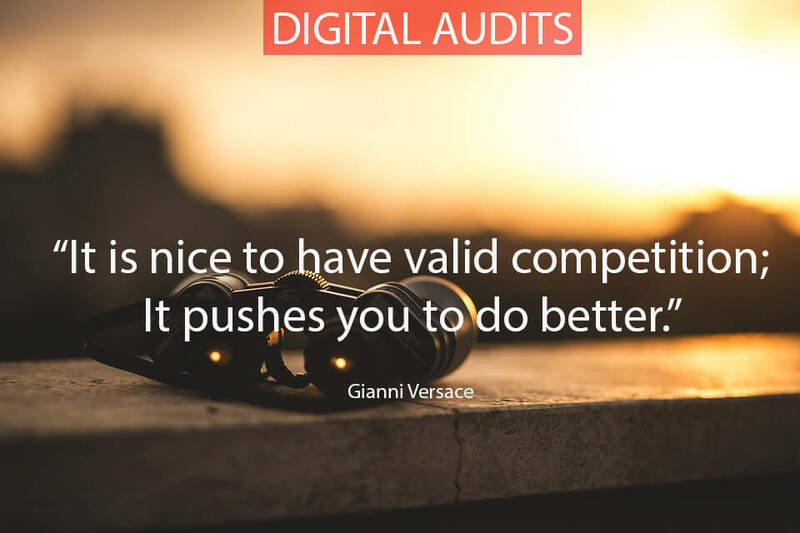 Hope you found this article useful, to learn more about Auditing your Competition, you can check our dedicated page on Digital Audits.